Summary: The project will begin in May of 2012 and will terminate in November 2013. Between May and November 2012, BNP resource managers will monitor nesting activity of loggerheads on Elliott Key. Between November 2012 and March 2013, there will be 20 days of large-scale volunteer cleanups. Marine debris will be collected, weighed, categorized, and removed for disposal. From May-November 2013, sea turtle nesting site beaches will again be monitored for nesting activity by volunteers from the Biscayne National Park Turtle Monitoring Program under the direction of BNP biologist Vanessa McDonough. Results: CCC Volunteers were transported via BNP vessels to Elliott Key where they manually removed accumulated marine debris from the coastal dune area of the loggerhead sea turtle nesting beaches. 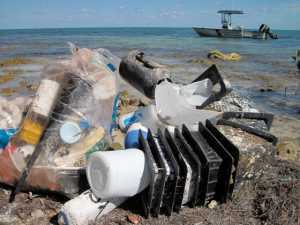 Over the course of twenty marine debris removal events, a total of 229 volunteers donating 1,815 volunteer-hours collected 10,481pounds (5.2 tons) of plastic, glass, and rubber items as well as a significant amount of abandoned, lost, or otherwise discarded fishing gear (ALDFG) such as plastic crab/lobster traps, polypropylene lines, Styrofoam buoys, nylon nets, and mooring lines. BNP resource managers, staff, and volunteers monitored sea turtle nesting activity on Elliott Key throughout the summers of 2012 and 2013. Volunteers and park staff searched for nests, protected them with wire mesh screen, and trapped and removed raccoon predators from the coastal dunes of eight beaches. In addition to observing an overall increase in loggerhead sea turtle nesting activity on Elliott Key, BNP staff observed and recorded the first-ever Green Sea Turtle (Chelonia mydas) nest on the island. The nest was intact and was protected with wire screen. BNP Staff observed 66 hatchlings emerge from this nest.